CBORD announced today that they are releasing a new campus lock solution that provides campus housing with an easier, quicker, and more secure option for on campus security. The two types of locks, Campus Lock and Computer-Managed Lock, are both offline card readers that are equipped with CBORD’s CS Access Solution. They allow the management of all doors, both online and offline, on a single platform, allowing easier access changes. They are being manufactured by Ingersoll Rand, CBORD’s long time partner in access control. Ithaca, New York: The CBORD Group, Inc., the leading supplier of campus card systems and integrated security solutions to the college and university market, today announced the release of the CL (or Campus Lock) and CM (or Computer-Managed lock) offline card readers. Both locks are fully integrated with CBORD®’s CS Access™ solution, allowing users to configure and manage the devices within a familiar interface. While both are offline locks, there are several distinguishing features between the CM and CL. The CM is an ideal solution for access locations with low turnover, with databases distributed via PDA. The CL uses properties and matching rules to determine access; privileges are carried on students’ cards, eliminating the need for university staff to visit the lock to effect access changes. Both Schlage® locks are offline, cost-effective, and manufactured by CBORD’s long-time partner in access control, Ingersoll Rand®. “Managing all of our doors, both online and offline, on a single platform [CS Access] will remove a lot of work for us, rather than having to duplicate efforts across various platforms in order to make access changes,” say Pascal Robert, Director, and Stuart Reed, Assistant Director, Campus Card Office, University of Texas at Arlington. “The Schlage CL and CM offline locking systems complement the online capabilities of our networked wired and wireless access control products, broadening CBORD’s access control applications and capabilities in the higher education market,” says Beverly Vigue, Vice President, Education Vertical Market, Ingersoll Rand Security Technologies. The CBORD Group serves colleges and universities, corporations, healthcare facilities, chain restaurants, supermarkets, and a host of other market segments. CBORD’s products are used in access control, integrated security solutions, campus ID card privilege control, food service, housing services, cashless dining, catering, nutrition services, online ordering, and other institution-wide activities. The CBORD Group serves more than 6,000 clients in the U.S., Canada, Europe, South Africa, the Middle East, New Zealand, and Australia. Ingersoll Rand’s Security Technologies Sector is a leading global provider of products and services that make environments safe, secure, and productive. 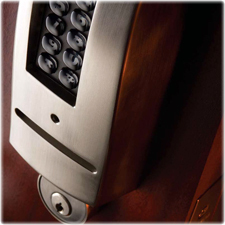 The sector’s market-leading products include electronic and biometric access control systems; time-and-attendance and personnel scheduling systems; mechanical locks; portable security; door closers, exit devices, architectural hardware, and steel doors and frames; and other technologies and services for global security markets.www.securitytechnologies.ingersollrand.com. Ingersoll Rand is a leading diversified industrial company providing products, services, and integrated solutions to industries ranging from transportation and manufacturing to food retailing, construction, and agriculture. With a 135-year-old heritage of technological innovation, we help companies worldwide to be more productive, efficient, and innovative. In every line of our business, Ingersoll Rand enables companies and their customers to create progress.